Why did it take an Australian to show me the light on a low calorie, delicious, and fast breakfast? Where has this idea been hiding? Perhaps, the United States is just lame-o when it comes to egg cooking. How many of you have had a rubbery omelet in the last week? My husband is Australian (Crocodile Dundee), and he took me to breakfast in Melbourne and I had (get this) a soft boiled DUCK egg. I thought I had died and gone to heaven. I am not going to name my DH "Crocodlile Dundee" - even though it is very tempting. The most successful blogger on the planet The Pioneer Woman named her cowboy husband, "Marlboro Man". Since, I want to remain married, I think I will call my husband "Matt". It still took me almost 3 years to attempt soft boiled eggs at home. Why? Because, you need the right spoons and egg cups - and I didn't have either. 2. You need "egg cups" to hold the egg when you eat them. I went to Williams-Sonoma and they wanted to charge me $14 for ONE egg cup (French china). Who has $14 for one egg cup? There are a couple good sources for egg cups. First, try your favorite Salvation Army or Good Will, just like fondue pots, people get rid of these because they never use them. Another good source is eBay - see here: Egg Cups on eBay. BEWARE: eBay is a great way to procrastinate doing other things you should be doing - like writing your blog. If you have never bought anything on eBay, it is like an online "garage sale". There is a bunch of random stuff from all over the country, and you will love some of these egg cup choices. I think I wasted 20 minutes looking at all of them. The egg cup in the above photo was purchased at IKEA. I couldn't believe I found them there. We Live on boiled eggs here in the UK. You must have soldiers with it - toast cut into strips to dip in the yolk. I grew up on this! My parents came from Sicily in 1968 and we called this "uovo bagno pane"..which translates to "bread bathed in egg"! I loved this meal so much I started an egg cup collection! My Gran used to make these with buttery toast soldiers for breakfast when she would visit! We had Adorable egg cups :) I wish I could find some at the goodwill or SA!!! That reminded me of that one show on TLC. I can't remember the name of it, but the guy that puts himself in the dessert and shows how to survive in such situations. He got an ostrich egg and put it water over a fire. When he cracked open the top it looked like the egg you have pictured. It looks delicious. I just looked on the IKEA website but they did not have them :( The one you show here is so cute! And I wonder if the small "cranberry" spoon that came with my silverware would work? It is a little wider than a regular teaspoon. My 7 year old son loves it for soup. I guess we'll have to try it. Hi Marcy - IKEA would only have this in the store - and it was a year ago -so who knows. did you look at eBay? They have some that are "buy now" that are cute and cheap. I first had soft-boiled eggs as an exchange student in Bavaria in the 70's. My German mom made me an egg every morning, and she had a special way of cutting off the top of the egg perfectly! I like to hunt for vintage egg cups ... there are some really neat ones out there! Thanks for reminding me of this healthy staple! My parents are immigrants from Europe which is probably why I grew up with these. Took me a long time to find egg cups for my own household. I do so love a 4 minute egg! Grapefruit spoons work really well to crack the shell as well as to scrape the sides of the egg. Thank you for reminding me about this! I just had eggs over easy and strawberries. Yum. Eggs are such a perfect food! My parents come from Italy and soft boiled eggs were a staple for me for breakfast growing up. We never had "egg cups" or "egg spoons" My mother often served these eggs in a shot class with an espresso spoon...which is how I still serve them, works just as well, much less expensive! These eggs look like they are under cooked. I could never eat an egg that way. I prefer mine scrambled with mushrooms,onions,green pepper,a half a slice of deli ham (sandwich meat)...and a bit of melted cheese ontop. The more vegetables in it,the better. Soft Boiled eggs are the standard worldwide except for in the US. If you want the layman's version, just soft boil them, and carefully peel while still hot (whole egg) and then you can mash the egg on toast. I realize this is not as fancy, but it works - and no fancy dishes are REQUIRED like an egg spoon or egg cup. I also like to mash them as they are often served internationally - with cheese. and finally, I have also mashed them in a cup - a small expresso cup, with salt and pepper, and eaten them with a fork. They all work - no special dishes required. I really don't like soft eggs,, ditto @ Arlene because they do look undercooked. Ooo, I'm totally going to try this! I will try to resist buying those adorable egg cups and spoons until I make those eggs a few times though. if you don't want to procrastinate for 3 years, just use a tea spoon, i've been using these with great success my whole life. a handy option for a makeshift eggcup is a shot glass. works for me. I am so way into eggs lately. Healthy low cal high protein. I have never had a soft boiled egg I am more into the medium/medium well boiled egg. I love the idea of eating it with the egg cup and spoon. I've been eating soft boiled eggs for my whole entire life. I can even remember my Dad feeding me them when I was a toddler - and might I add - all without an egg cup or egg spoon in sight!! My Irish born mother made these for me often. Now i make them for my daughter who loves them. You definitely need the cups, but we do use regular teaspoons. I'm from Santiago, Chile and when I was a little girl, my drandma would make this for me every morning, during summer vacation. She had this adorable chick egg cup holders, that I loved. Our last trip to Santiago, my Dad started cooking this for my kids. They absolutly loved them. I wanted to make them at home, but just like you, didn't have the cupes. I found them at Crate & Barrel online, and they are very inexpensive ($1.95 each and the have a new model now, glass ones for $0.95 each). I also got a very practical tool. It's an egg timer, The perfect egg timer. Lets you know exactly how soft or hard your eggs are, adjusting depending on how many eggs you are cooking. It is very visual, so it makes it so easy to know when to take them out. (http://www.crateandbarrel.com/kitchen-and-food/thermometers-timers/egg-timer/s353892). I hope this help somebody else enjoy this delicious morning treat. I love soft boiled eggs! Since I stopped using non-stick pans I find that I can still enjoy my "dippy eggs" this way. I just put a couple of them in a bowl & use my (dry) toast to sop up the golden yumminess! I have always loved soft-boiled eggs but it has been a long time since I had one! One of my favorite breakfasts, similar in nature, is a poached egg on toast. Thanks for the reminder though! Everyone but U.S. does this it sounds like! We always woke to soft or hard-boiled eggs (with a little melted butter mixed-in) with toast for breakfast when spending the weekend with our Dutch grandmother. Still love my eggs this way. My Grandpa (who was first generation American) used to make these for me when I spent the night at his and my Grandma's house for breakfast. I have egg cups that I got from World Market a while back and need to make this for my husband! I have always loved soft-boiled eggs eaten from the shell. They just taste better sitting in the cute egg cups with the tiny spoon to enjoy them with and such a lite treat. We do. My great great grandmother pulled her egg cup set across the country in a hand hart. My grandmother use to make this for us all the time. I still have my egg cup(I think it's a chicken)lol Grandma put a dab of butter in the opening...so good with soldiers. We are Canadian but Grandma had menonite heritage. Going to have this soon. My parents are europeans, and my Mom had a cute pair of scissors shaped like a bird that were used to cut off the top after it had been cracked. I have just immigrated to the US from the UK and was amazed that no one here had heard of boiled eggs and soldiers :). Took me ages to find egg cups, but I did eventually at Bed, Bath & Beyond. Before then, I used measuring cups (not very successfully). You don't need special spoons - just give the top a good bash with a teaspoon or butter knife and you're sorted. My mom always made eggs this way when I was growing up. But maybe it is because she was raise in Europe. Haven't had a soft egg in a cup in..well, decades. I remember having eggs like this when I was going to school in the 60s. 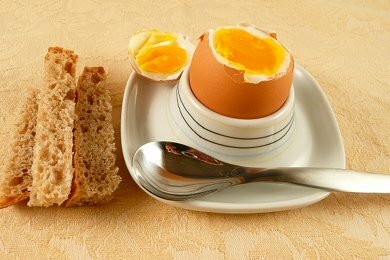 Soft boiled eggs in an egg cup and we would just crack the tops and eat out of the shell. Brings back good memories. I believe many people stopped cooking eggs because of the salmonella scare. I believe many people stopped cooking eggs soft boiled, which does not really cook the yoke well, because of the salmonella scare. I grew up with these soft boiled eggs. My grandmother use to make these all the time for me. With the toast all buttered nice and cut into finger strips. Yum.. How Good they are. Soft boiled eggs bring back memories. My mother used to make these with toast points for us often when I was a child. I haven't had one as an adult. Maybe, just maybe I'll have to try one again. i remember a lot of pepper on ours. Glad you liked it! Loved reading all the emails. We have always had soft boiled eggs on off over the years since i was a kid. I use a dessert spoon to fish them out. I have never heard of an egg spoon. I think like mario my italian grandfather used to break up bits of bread and mix the egg. I still eat this when i am sick sometimes. I Have also put them straighht onto toast which is cool too. I never heard of the shot glass but my family are not big drinkers. @Andrena I think the show you are talking about is "Survivor Man". I think. However, I don't remember it as "the guy that puts himself in the dessert and shows how to survive in such situations." It would be cool to see how he survives in a chocolate cake though! LOL! Easiest way I have found to make soft-boiled eggs: Put the egg(s) in a pot with enough water to cover them. Put the pot, uncovered, on med-high heat. When the water boils, remove the pot from heat and cover it. Set the time for 5 minutes. After the timer goes off, submerge the eggs in cold water to stop the cooking. They always come out beautifully soft and perfect! This is a joke,right? How comes Americans dont serve soft boiled eggs in egg cups regular? Just had four myself but i mashed them in a cup today and dipped my buttered toast soldiers into the mug. Lovely. My mum brought us up on these morning treats. And also many car boot sales in England on sunday often sell egg cups and spoons for pennies. I wouldn't buy the freshest eggs you can find. Most of the time it actually works a little better with older eggs. About a 5 day minimum. This sounds great, less fat that a fried egg which is the custom in the USA. Just found me some cups and spoons on flea-bay for cheap...that's all you need! I hope you know periods always go inside the quotes! My mother made soft boiled eggs regularly when we were young (1950s). I loved them. The whites were perfectly set and the yolks still runny and creamy. We would tear up a slice of toast, add the egg and break up the white, then toss it to cover the pieces of toast with some of the yolk, add a little salt and pepper--delicious. For some reason, I don't remember her making them after we got to about high school age. Sadly, I have never been successful at getting eggs boiled just right to make them myself. Sarah Rizzuto - not in the UK they don't (where we also love our soft-boiled eggs, and have hens vaccinated against salmonella). Yes i was just turned onto soft boiled. But being an expat in thailand, i didnt require the perfect spoon and bowl. Just put in egg before the water boils, wait three - four or so minutes on high,, cool it in running water, peel it carefully. Enjoy the soft feel of your new squishy egg, and then sprinkle a bit o'salt on the top apex of that soft gooey egg. Finally,bite into it. Enjoy the rich hearty, egg yoke burst in your mouth. Yumm. Thanks! 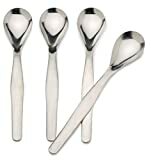 My stepdad wants these for xmas, so I am buying the spoons you suggested from amazon. I use to eat soft boiled eggs as a child. One of my favorite breakfasts. My family used to crack open the egg and scrape out the innards into a bowl then cut the toast into squares and dump them on top. No special equipment required and it is delicious! I found egg cups at Bed Bath & Beyond for something like $2 apiece. I love these eggs. I usually un-shell them at the sink and put into a small bowl and dip my toast. I don't have egg cups, either. If you're still looking for egg cups, try amazon.com, ideeli.com, onekingslane.com and some of those other discount sites. (My brother-in-law is a buyer at amazon.com, but otherwise no affiliations.) I've seen them on sale in the kitchen and tableware sales for reasonable prices--and thought of you! I grew up in New Jersey and soft boiled eggs were regular treat in our house. We always had them when we stayed at my grandmother's house, too. I think people don't have the time or energy (or egg cups and spoons). I have found a way to do this in the microwave without the shell and it is quite tasty. So simple, elegant and delicious. Why didn't I think of this? Found adorable egg cups and tiny metal spoons in my kitchen. Both previously unused gifts from Mom. I collected a fresh egg from my chicken coop. Six and 1/2 minutes in the boil and it was perfect for dipping strips of wheat toast. Mom used to prepare a bowl of diced soft-boiled egg and diced buttered toast topped with pepper and salt. You took me back to a forgotten childhood favorite. Thank you Snack-Girl! I love your website! I am no longer attending WW meetings due to foot surgery and I am so happy to have found you! You also have a wonderful personality that comes through well! All the best! I frequently have either hard or soft boiled eggs for breakfast and don't use an egg cup. Perhaps I'm just lucky, but I'm able to peel without much of a problem at all. LOL...haven't had rubbery scrambled eggs in ages! I know, it's a little late to answer this thread, I'm writing from germany, where soft boiled eggs are a very usual part of the breakfast and since there was a question about the proper spoons: Never use a SILVER spoon to eat soft boiled eggs, it gets oxidation and a real awful taste, as if the egg was spoilt (but in fact it isn't, it's just the silver, that makes this taste) and if you try to show someone, how yummy a soft boiled egg is and you serve it with silver spoons, you could spoil his appetite for it for ever and ever - what a pity! Nonsense, egg cups are not vital. Whenever I visit pals in Canada (who never seem to eat boiled eggs) I simply fold up a piece of kitchen paper, smack the base of egg gently but smartly on the table and place it on the paper. Eat and enjoy as if it were in an egg cup. my people are from Scotland and i remember my grandparents ate eggs like this most every morning. the trick is getting the little top off.grandpa had a special knife that seemed to work well. i saw a gadget on the "kitchen" that lopped it off very well, it was one of the kitchen gadgets they tested. i will look at amazon, but the last one i got came with spoons and 2 egg cups, it was a nice set but the gadget just broke the shell and got shell fragments into the egg....yuk. I grew up on soft boiled eggs in Spain, then forgot about them after years in the US. Just bought some egg cups on a recent trip to Victoria, Canada and have started fixing them again. My american husband was like "WHAT IS THAT EGG CUP THING?" if you are referring to soft boiled eggs that you sit in a cup and then cut the top off with a knife, i love them, my grandparents were from scotland and thats how they ate them, i also remember they only ate ONE. my problem is cutting the top off, ive tried and failed, had to eat little pieces of shell, ive tried gadgets and they didnt work. please give us a course in "how to open a soft boiled egg"in a cup. I bought this egg-tool for my parents last year as a present for easter - and the whole family is absolutely delighted - it really works! hi, i found the "clack" egg gadget on amazon. yes, I forgot to mention, I'm writing from germany - yes the clack egg gadget is indeed a german product (Eer I'm not in any relationship with the manufacturer! ;-) ). But I guess they sell worldwide, I found it on ebay after my Dad told me, he has seen a "egg heading machine with a ball falling and clacking the egg..." on tv. Then I bought it for easterpresent for my parents who have every sunday morning they soft boiled egg - and since they got it this two grown seventies, normally living quiet and peaceful, have a discussion every sunday morning about who may use it first :-o :-))) so I was sure it worked and bought it for our family too - I just can say yes, its a great invitation for people who want to eat the soft boiled egg in a civilized way. GOOD NEWS, i found them on amazon.com. $11.95 and free shiopping, ill be so glad when it arrives and i might make them an easter gift for family. great, I'm happy for you - and heeeyy, they are much cheaper than I bought them in germany :-o I paid about 20 € at here! I hope your family likes it and enjoys the soft boiled easter eggs then without shell pieces. I suppose the clack egg tool will be perfect for you - even my mother, who is always quite sceptical towards new things found it good working - so I hope you will, too. You must tell us about, when you received and tested it, ok? Well you learn a new thing every day! Never in my wildest dreams did it occur to me that EVERYONE didn't eat boiled eggs?? Get on board the eggspress people! I have some silicone egg cups, but I like a shot glass too. I think a better way to handle soft boiled eggs is to peel them just like hard boiled eggs and serve them on toast or whatever. I tried soft boiled eggs and cut the top off with a chef knife (worked well) but scooping the egg from the shell is a pain. Some time later I ran across recipes saying they really aren't hard to shell. I found that to be true, although I must admit these were old eggs and I think the age of eggs is critical not only for boiling them but also poaching them. At any rate. Perfectly soft boiled eggs can be peeled and laid out on toast, hash, or however one wishes. Don't be afraid.